Help us make a girl's dream come true. 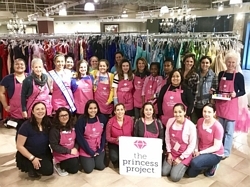 San Diego has been helping girls since 2009 find their prom dress. We collect 1,000’s of dresses each season. We hope to collect over 2000 this season. Over the past 8 years we have given away 6,050 dresses. Complete the form below to send The Princess Project San Diego an e-mail message.